This one is actually an unfinished watercolor practice piece…pretty sure I need to find some classes! A wine glass I painted recently at a group function. 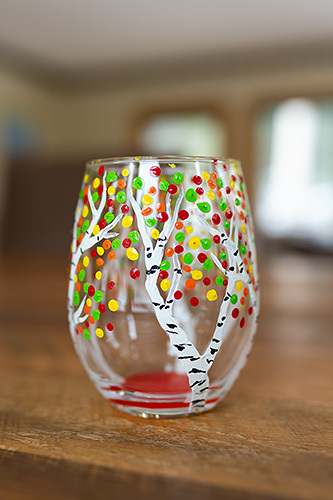 I actually did keep this one for myself, because I’ve wanted wine glasses with aspens on them for a while! Nope. No, no, no. Huge fail and ugh, how my heart aches every time I have thought about it since that fateful day that my hard drive crashed! I brought it in to a company specializing in data recovery and was told that no, they could not help me. The things, the wonderful memories I lost! Not only was it the photographic proof of my gifted art pieces, but also countless photographs of memories and experiences in my life: photos of my friends and me in high school and college, birthday celebrations, boating with family, camping and backpacking trips. All those beautiful memories I won’t ever get to see again or print and share with my kids, or their kids. The accused…I just couldn’t bring myself to throw it away. One of these days I’ll take it back in somewhere and see if my files are still there. And something else I can share for those who may not know: my memory is terrible! I have developed tactics to help, but man, that “mom brain” is NO joke! The more time that passes between now and the moments that made up those photographs, the more I forget and the more I regret the loss of all those files. This all occurred before cloud storage was a big thing, which brings me to my next point: the evolution of technology. I may be dating myself a bit here, but remember the floppy disks? First it was the 5.25” and then the 3.5” and yes, I was old enough to clearly remember having to move data from one medium to the other so I wouldn’t lose files as one form of storage was replaced with another. And so the story goes and has been repeated numerous times since with more recent media types. Who can say how we will store our information in the future and can you guarantee those methods will be failsafe? This is one of the many reasons I specialize in helping the families I work with print the art I create for them. I ensure their portraits will last generations by using archival inks that will not fade, paper that will not degrade and, when necessary, glass that protects the art behind it from the harsh effects of UV light and humidity. And the best part about all this is the joy and love I get to witness on their faces when they see their beautiful stories hung on the walls of their homes and sitting on their shelves and coffee tables. Knowing that they will treasure this art every day as they walk around their rooms, that their children and their children’s children will also hold these pieces dear as family heirlooms brings my giving artist’s heart the greatest happiness imaginable! Stay tuned for Part two of why you should print your family photos next week!